PRETORIA, July 24 (Xinhua) -- China and South Africa on Tuesday pledged to carry forward their traditional friendly relations and advance their comprehensive strategic partnership in the new era. During the talks between visiting Chinese President Xi Jinping and his South African counterpart Cyril Ramaphosa, the two leaders agreed to strengthen high-level exchanges, deepen political mutual trust, align their development strategies, promote practical cooperation and increase people-to-people exchanges, thus enabling the two peoples to enjoy more fruits of the bilateral cooperation. 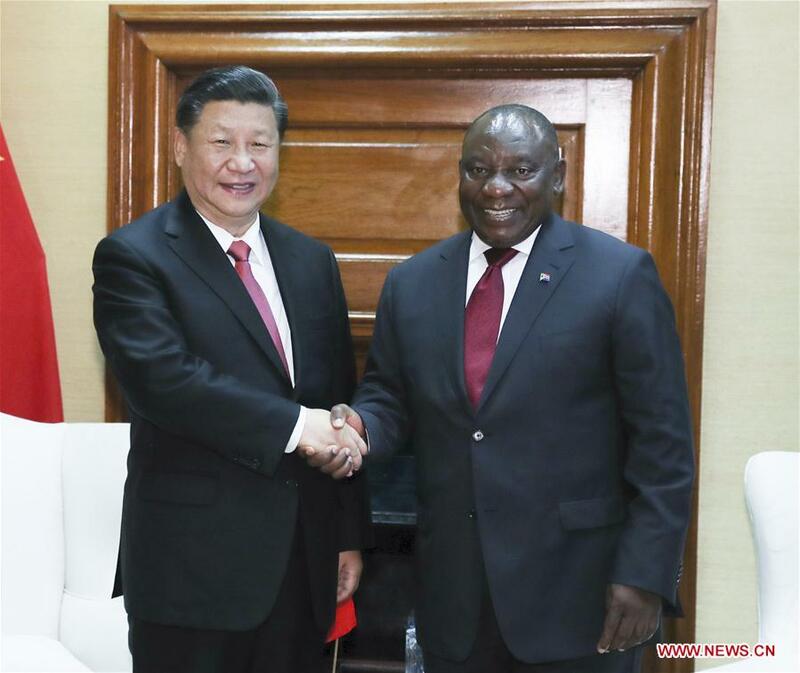 Xi expressed appreciation to Ramaphosa for his important contributions to the establishment of diplomatic ties between the two countries and to the development of bilateral relations. Noting that China and South Africa are both major developing countries and emerging-market countries with important influence, Xi said that since the forging of diplomatic relations 20 years ago, the two sides have been committed to mutually-beneficial cooperation and common development, stood together through thick and thin, shared weal and woe, and established a "comrade plus brother" relationship featuring sincere friendship, mutual trust and close bond. He said that China-South Africa relations have leapt from a partnership to a strategic partnership and then to a comprehensive strategic partnership over the past years, bringing tangible benefits to the two peoples. "Taking the opportunity of the 20th anniversary of diplomatic ties, China stands ready to work with South Africa on supporting each other in hosting this year's BRICS summit in Johannesburg and the Beijing summit of the Forum on China-Africa Cooperation (FOCAC), inheriting the past and ushering in the future, and pushing for more outcomes from the bilateral comprehensive strategic partnership, so as to bring greater benefits to our two peoples," Xi said. -- The two sides should strengthen high-level exchanges, deepen political mutual trust, support each other in independently choosing the development path that suits their own national conditions, continue to understand and support each other on issues involving respective core interests and major concerns, increase exchanges between the governments, legislative bodies and various other areas, and deepen the inter-party exchanges and cooperation. -- The two sides should enhance cooperation within the frameworks of the Belt and Road Initiative and the FOCAC, align their development strategies, deepen exchanges and cooperation in new economy sectors and sunrise industries, and share the development opportunities brought by the fourth industrial revolution. The Chinese side is willing to focus on promoting cooperation in such areas as infrastructure construction, trade and investment, scientific and technological innovation, and finance, and supports the endeavors made by the South African government to develop the economy, create jobs, improve people's livelihood and promote social transformation. -- The two sides should deepen people-to-people bonds, implement the consensus the two sides have reached on facilitating personnel exchanges and strengthening cultural and educational exchanges, and consolidate cooperation in human resources development and tourism. -- The two sides should promote security and law-enforcement cooperation. The Chinese side is willing to strengthen cooperation with South Africa on law-enforcement capacity building. -- The two sides should increase coordination within multilateral frameworks including the UN, G20, BRICS and BASIC (Brazil, India, South Africa and China), jointly safeguard multilateralism, oppose unilateralism and protectionism, and promote a more just and equitable international order. For his part, Ramaphosa said that South African and Chinese peoples enjoy traditional friendship, and the two countries have constantly consolidated and developed their relations since the establishment of diplomatic ties 20 years ago. The relations have gone beyond the bilateral scope with important strategic significance, and the two countries have carried out fruitful cooperation on regional and multilateral levels, he said, noting that the special friendly ties have brought substantial benefits to the two peoples. Ramaphosa said that it is in the fundamental and long-term interests of South Africa to continue to strengthen political mutual trust, expand practical cooperation, enhance scientific, technological and people-to-people exchanges with China, and promote their comprehensive strategic partnership. He pledged that South Africa will continue to firmly adhere to the one-China policy, push for positive progress in cooperation within the framework of the Belt and Road Initiative, increase communication and coordination with China on major international and regional issues, oppose unilateralism, strengthen multilateralism, and safeguard the common interests of developing countries. On the 10th BRICS summit in Johannesburg on July 25-27, Xi said that it is the first one to be held in the second "golden decade" of BRICS cooperation and has a special significance. BRICS gathers the world's five major emerging economies -- Brazil, Russia, India, China and South Africa. "We should bear in mind the big picture of BRICS cooperation, constantly cement our strategic partnerships, make a loud and clear voice on upholding multilateralism, and jointly build an open world economy," Xi said, while pledging to coordinate with and support South Africa for a successful BRICS summit. Xi and Ramaphosa will co-chair the FOCAC Beijing summit in September. Hailing the contributions that South Africa has made for the institutionalization of the FOCAC and friendly cooperation between China and Africa as co-chair of the forum, Xi said that China looks forward to discussing with African countries on plans to promote China-Africa friendly cooperation in the new era and jointly build a closer China-Africa community with a shared future. "It is China's long-term and firm strategic choice to strengthen solidarity and cooperation with African countries," he said. Ramaphosa expressed gratitude for China's support in the 10th BRICS summit in Johannesburg. He told Xi that he looks forward to attending the FOCAC Beijing summit and will coordinate with China to ensure the success of the two major events. After the talks, the two heads of state witnessed the signing of a series of bilateral cooperation documents and met with the press. Ramaphosa held a grand welcome ceremony for Xi prior to the talks. Xi arrived in Pretoria on Monday to pay his third state visit to the "rainbow nation." South Africa is the fourth stop of Xi's five-nation Middle East and Africa tour, which has taken him to the United Arab Emirates, Senegal and Rwanda. He will also visit Mauritius during a stopover.